WORD is an independent neighborhood bookstore in Greenpoint, the northernmost neighborhood of Brooklyn, that will celebrate its third anniversary this March. Our primary goal is to be whatever our community needs us to be, which currently means carrying a lot of paperback fiction (especially classics), cookbooks, board books, and absurdly cute cards and stationery. In addition, we're fiends for a good event, from the classic author reading and Q&A to potlucks and a basketball league (and anything set in a bar). We're a small operation, just 1000 square feet and four people, but we read too much, so it all works out. If a weekly dose of WORD here isn't enough for you, follow us on Twitter: @wordbrooklyn. Despite my long-term love/hate relationship with Jack, I still squealed like a little girl when I saw this had arrived. The author of River Town and Oracle Bones takes a 7,000 mile trip across northern China to begin his third book, Country Driving, in which he again thoughtfully examines the both the rural and urban economic development of this growing nation with his usual excellent storytelling. 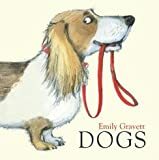 A celebration of all the different types of dog (from a most unlikely source) that is brought to life by Gravett's fantastic illustrations. This is the sort of book that either makes you really fun or really boring at parties, depending on what sort of parties you go to. These aren't anything new in the larger book world, but they're new to us and so awesome that I have to feature them. They are fantastic, including re-prints of fifty-year-old books (Killing Castro by Lawrence Block) and even a book from WORD favorite Pete Hamill (The Guns of Heaven). We have already sold out of The Corpse Wore Pasties by Jonny Porkpie.